I'm looking to replace one of the two switches (wired in a standard 3-way configuration) which control an overhead light in a utility room, with an occupancy sensor switch. The room is small enough that the one sensor should provide adequate coverage. Neutral is wired as normal. The occupancy sensor turns the light on or off by making or breaking the connection between its black and red wires (and the black, being connected to hot, probably powers the logic as well). Meanwhile, the blue wire goes back to the other mechanical switch; this switch either leaves the blue wire open, or shorts it to ground. Apparently the mechanical switch needn't even be a 3-way switch, a single-pole one would be fine (despite the labeling in the drawing). I can't quite figure out what's going on. Yup, I agree with your read. That is exactly what's going on. I am fairly impressed that UL even allowed this... I seem to recall seeing a bulletin from NFPA to the effect of "alright UL, it's time to stop approving things that use ground for more than ground". Although it may be still allowed since it is surely a millivolt current. Regardless, it's rather ingenious. It liberates two wires completely, so for instance if the other switch is a remote spur, you can now use black and white for onward power. Still won't let the put the sensor at the remote spur, that would require 4 wires (line, load, neutral and sense) plus ground. I think that you are getting confused by previous experiences with 3-way switches. The OS306U is an electronic device, much like a light dimmer. The controller accepts inputs from three sources. All three of these inputs probably connect the associated input pin to ground (same as the remote switch). The controller is programmed to operate the output in a specific way, dependent on the state of the inputs. Not the answer you're looking for? Browse other questions tagged electrical lighting multiway-switch or ask your own question. 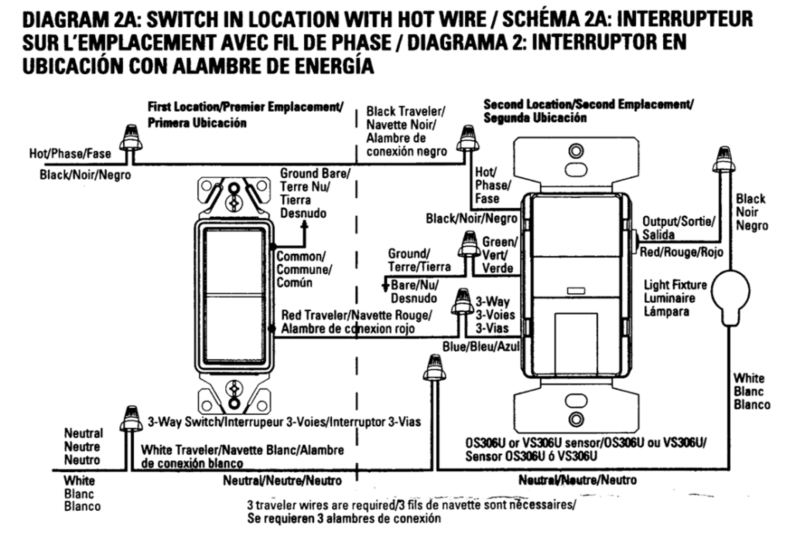 Why would the documentation say to wire a pole of the 3-way occupancy switch to ground?